Posted on 29 November, 2017 at 2:55 pm. There are a number of stages to fleeing domestic abuse. First, the victim must plan their escape. They may need to research nearby refuges, or contact friends and family to tell them what is happening. Second, they flee. For some people, this means moving in to a domestic abuse refuge, where they will receive help setting up their new life. Finally, when they are ready, they move into a flat of their own. Thanks to a grant from the Clothworkers’ Company, we are able to help more survivors who are making this journey to safety. In June, the Clothworkers’ Company Livery Fund awarded us a grant of £33,000 to support survivors of domestic abuse. The grant has allowed us to give tablet computers to Domestic Abuse Refuges to help survivors and their children move as quickly as possible from their abusive relationship into the temporary shelter of a refuge, and through into independent living. Within abusive relationships, technology can be used as a means of exerting control over the victim. Abusers often use their victim’s mobile phone as a tracker to monitor their movements, or routinely examine their Internet browsing histories to ensure compliance. For someone trying to escape an abusive relationship, access to a Refuge tablet computer allows them to lay the foundations of a new life without fearing reprisals at home. Once a victim has escaped their abusive relationship, they will likely be housed in a Refuge far from home to protect them from their abuser. This means that they have to leave their old life, career, family and friends behind, and can quickly feel isolated. 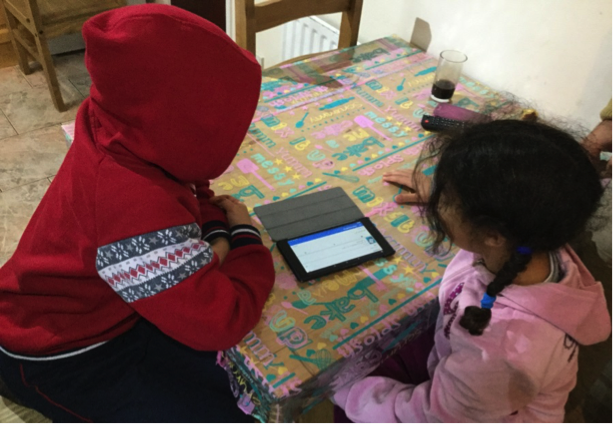 A tablet computer lets them stay in touch with friends and family and let them know that they are safe, and can help create a sense of normality in unfamiliar surroundings. Many government services are only easily accessible online, and children often require the Internet to complete their homework. By gifting the Refuges with tablet computers, we can support survivors of abuse to access housing, employment, financial support, education, entertainment and online support groups. Our Project Officer Deirdre has been identifying Domestic Abuse Refuges across all areas of the UK that we can assist in this work. We hope to be able to support survivors and children in at least 25 refuges with this fund. Thank you to everyone at the Clothworkers’ Company who selected WaveLength as the recipient of this fund.